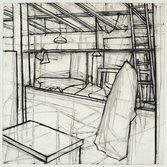 The Dobell Prize aims to encourage excellence in drawing and draughtsmanship among Australian artists. 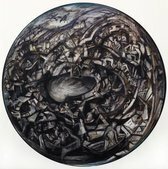 Held annually at the Art Gallery of NSW from 1993 to 2012, it was initiated by the Gallery and the trustees of the Sir William Dobell Art Foundation (established from the estate of Australian artist William Dobell). Each year the foundation’s trustees invited a guest – often an artist – to judge this open competition, and finalists were displayed in an exhibition at the Gallery. The winning work automatically became part of the Gallery’s collection, and over the years a small selection of finalist works were also acquired. Together these form the Dobell Australian Drawing Collection. What constitutes a drawing was deliberately not outlined in the conditions of entry. This flexible approach ensured a great variety of drawings were submitted, ranging from those made using materials traditionally associated with drawing (pencil, pen and ink, charcoal etc) to those that are part of contemporary practice (including pastel, watercolour and collage). 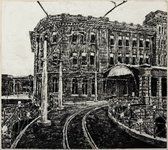 2012 marked the final year of the open competition known as the Dobell Drawing Prize at the Art Gallery of NSW. Since 2014, the Gallery has instead presented a curated exhibition called the Dobell Australian Drawing Biennial. From 2019, the National Art School in Sydney hosts a new approach to the competition.